The 'Star Wars' actor honored Carrie Fisher's legacy over Twitter. The Force is strong with the women of America. Luke Skywalker himself, Mark Hamill, offered words of support for all the Princess Leia Organa cosplayers that showed up for the Women’s March. 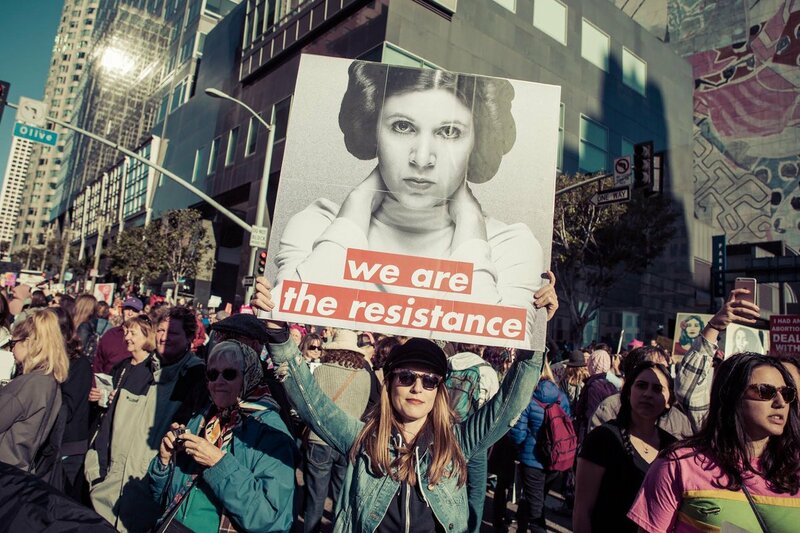 On Sunday, amidst the weekend’s many Women’s Marches held around the United States, Mark Hamill took to Twitter to share some of his favorite pictures from the March, full of women dressed up as Princess Leia or bearing punny signage with her face on it. “Carrie would be SO proud! Resist. Register. VOTE!” the actor’s tweet read, along with the fist emoji and #WomensMarch2018 and #MyReSIStanceSISters. The actress Carrie Fisher, who had portrayed Leia Organa since the first Star Wars movie from 1977, offered her final performance with the character in the recently released The Last Jedi. Fisher passed away in December 2016, but her character’s enduring legacy has long served as a symbol for what women can accomplish. Perhaps because The Last Jedi is still fresh in everyone’s minds — having only released in theaters last month — the Star Wars universe had a big showing at the 2018 Women’s March across the country. The annual Women’s March began last year after President Donald Trump’s inauguration partially as a protest to his presidency, but if 2018’s showing has been any indication, then the Women’s March has evolved into a yearly event that will long outlive Donal Trump’s presidency. If you liked this article, check out this video of all the times people got dissed by Princess Leia.